Satellite evolution occurred at a rapid pace once Sputnik and Echo were successfully launched in the late 1950s. Sputnik was a simple beacon transmitter whose signal was used to measure orbital and atmospheric properties and their effects on radio signals. 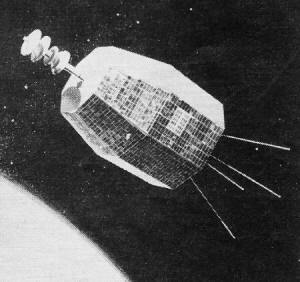 Oh, and also to announce to the world that the USSR had accomplished the world's first satellite mission - I'd brag, too. Explorer 1, the first U.S. satellite, launched the following year, measured and broadcast Van Allen Radiation Belt data. 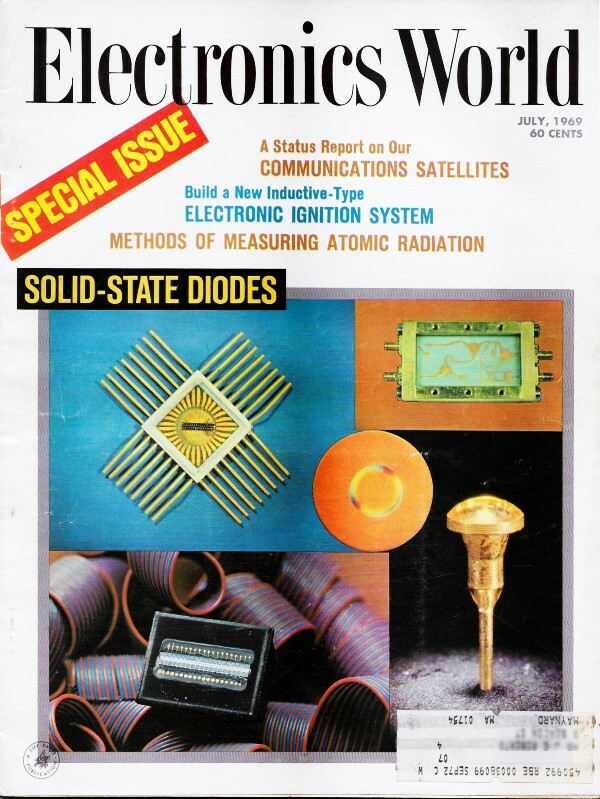 This Electronics World article appeared about a decade into the satellite aspect of the "Space Race." By then, a couple dozen satellites were circling (well, more accurately ellipticalling[sic] the earth, and they were active transponders that received on one frequency, then re-transmitted the amplified signal on a different frequency. The USA and USSR were still the only two countries with satellites at the time. Photos of six NASA satellites are provided so you can see the progression in platform configurations. I'm thinking Intelsat II's shape was inspired by a potentiometer. By Francis A. Gicca / Manager Space Communication Systems, Raytheon Co. Fig. 1. Operational communications satellites, earth stations and coverage areas. Not shown here are two additional NASA communications satellites, ATS-1 and ATS-3, located aver Pacific and Atlantic Oceans. All satellites are in stationary synchronous orbits, although. ATS-1 and -3 are moved occasionally. More than any other development in space, these successful satellites have had the greatest impact on our daily lives. Early problems and achievements are covered and descriptions of early satellites and their operating capabilities are included. On December 18, 1958 an Atlas-B boosted the tenth satellite in history into orbit. It contained a tape-recorded Christmas greeting from President Eisenhower and for 13 days this message was broadcast from the world's first communications satellite. A decade after this simple experiment on Project Score, it is clear that communications satellites have had more of an impact on our daily lives than any other development in space. The growth of this infant technology has been truly phenomenal; seven years after Score, the first international satellite (Early Bird) went into commercial service only to be replaced three years later by today's Intelsat III with five times more capacity. In the last three years six commercial comsats* have been orbited (see Fig. 1), representing an evolution of three generations of communications-satellite technology. Furthermore, this rapid progress shows no signs of slowing and by 1970 the fourth generation satellites will begin service with over twenty times more capacity than Early Bird. Of course, this explosion in satellite technology would mean little to us if the development of earth stations to communicate with the satellites had not kept pace. 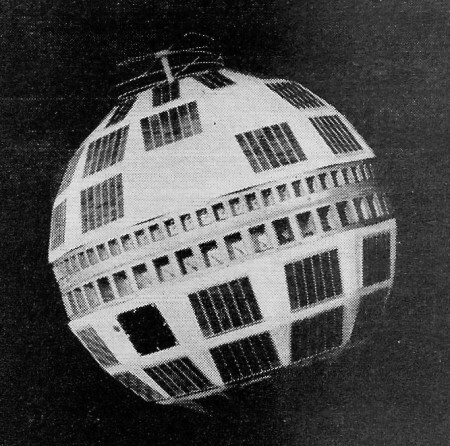 When Telstar was launched in 1962 there existed three experimental earth stations (in England, France, and the United States) that could use the satellite. By the end of 1968, the number of stations had risen to nearly 25 devoted exclusively to communicating with commercial satellites. By 1972 it is estimated that over 85 earth stations in 61 countries will be operational and over 5000 international telephone calls will be carried by these stations. This is about five times our current submarine cable and h.f. radiotelephone capacity. Impressive as these telephony figures are, the use of satellites for live international telecasts has been dramatic. Satellites brought us the 1964 Olympics from Japan, the 1968 Winter Olympics from Grenoble, several public debates between national leaders, Pope Paul's Christmas message, news events, and Apollo telecasts received from the moon by overseas tracking stations. Pope Paul's 1965 visit to the U.N. was the first major event telecast from the U.S. to European audiences by Early Bird. Other overseas transmissions have included news events, such. as the Johnson-Kosygin meeting in Glassboro, and the 1968 Mexican Olympics which were telecast to 400 million viewers around the world. Doctors in Geneva have observed open-heart surgery in Houston, asking questions on technique during the operation. An experimental international exchange of data and photos on wanted criminals resulted in the arrest of a thief a few days later. Clearly, communications satellites are having a major impact on our lives. Table 1. 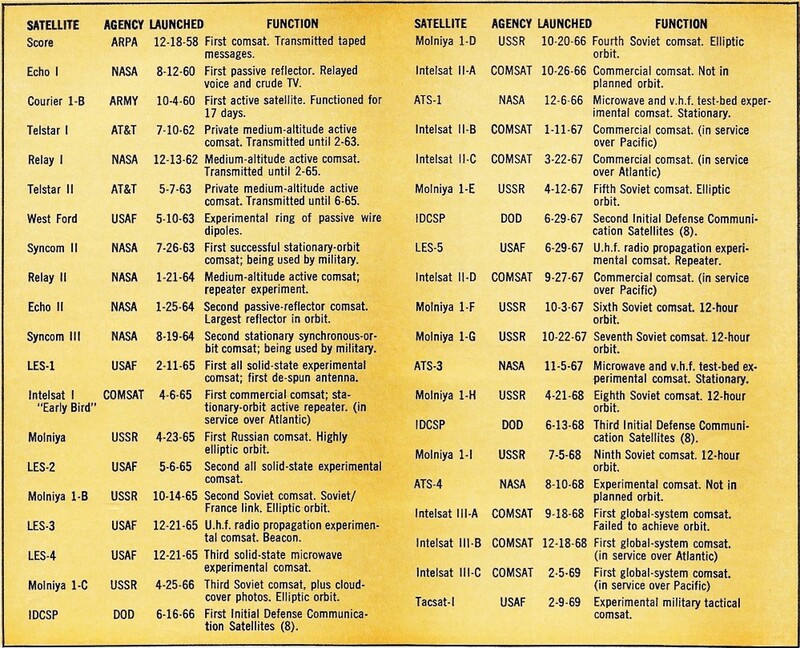 A complete listing of United States and USSR communications satellites. When Score was launched in. 1958 (see Table 1), it was not clear that satellites could be justified economically. Only two years earlier the first transatlantic cable had been completed, providing the first reliable overseas telephone service. *Throughout this 2-part series we will use this term for "communications satellites." It should not be confused with the capitalized term Comsat, which stands for the Communications Satellite Corp. Many did not believe that expensive and unreliable satellites could compete effectively with terrestrial facilities. It was also not clear how to design such satellites. Should a communications satellite be a passive reflector, like Echo, or employ the amplification of an active repeater? What orbital altitude would be best? Should the satellites be stabilized, and if so, how? The early experimental satellites were designed to answer these questions and to provide practical operating experience. Echo demonstrated the feasibility of using a passive reflecting balloon, but for the transmission losses to be small the balloon had to be both large and orbit at low altitude. At low altitudes a satellite completes an orbit quickly and so moves rapidly from horizon to horizon. This, in turn, requires a large progression of satellites simply to assure that one is always in view of the pair of communicating earth stations. Also, the diffuse characteristics of the reflected Echo signal were not appropriate for wide-band communications, and so quality was poor. Two months after Echo I, the Army's Courier satellite provided our first medium-altitude (675 miles) active repeater. The conclusion of this experiment was clear: amplifying active repeaters offer the most promise for high-quality communications. This led in 1962 to the significant Telstar experiments by the Bell System and NASA's Relay, both employing medium-altitude active repeaters. These satellites gave us our first TV transmissions by satellite and proved that excellent quality could be practically achieved. But, again, the relatively swift progression of satellites across the sky meant many expensive satellites and complicated earth tracking stations would be required. A solution to this problem was suggested by, among others, science-fiction writer Arthur C. Clarke many years ago: Place the satellite in a stationary orbit. At the Courier altitude of 675 miles, an orbit is completed in 107 minutes; at the moon's distance of 239,000 miles, a revolution takes about 27 days; and at the "geo-stationary" synchronous altitude of 22,300 miles, the orbital period is just 24 hours. If a satellite at this altitude is placed over the equator, it completes an orbit in just the time it takes for the earth to complete a revolution below. Thus, as seen from the earth, the satellite appears to stand still. This means that a satellite could be stationed over the Atlantic and permanently link Europe and the U.S. Although it was apparent that the synchronous approach would greatly simplify ground tracking and reduce the number of satellites needed, there were several major unanswered questions. First, the path loss at 22,300 miles would be 30 dB higher than at the Courier altitude, requiring 1000 times more ground and satellite radiated power for the same performance. Secondly, the two-way transit time is about 0.27 second and it wasn't clear that telephone conversations could tolerate such a delay. Finally, it wasn't clear that a stabilization system could be developed which would keep the satellite firmly in place ("station keeping"). Fig. 2. Orbital dynamics of Early Bird (which was later renamed Intelsat II, the first of the commercial communications satellites. Hence, in 1962 it appeared that only medium-altitude comsats would be practical. Such satellites would progressively orbit over all countries of the world. Unless international action were taken, it appeared likely that many nations would build their own systems, resulting in a multiplicity of different satellites, each capable of providing global communication services. The Communications Satellite Act of 1962 established the Communications Satellite Corporation (Comsat) and charged it with the responsibility of representing the United States in international efforts to develop a single global satellite system. 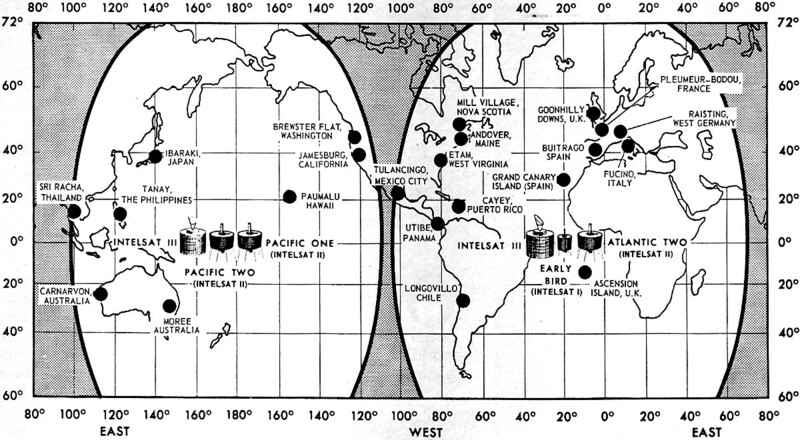 Under the auspices of the United Nations, nineteen nations agreed in 1964 to form the International Telecommunications Satellite Consortium (Intelsat), affirming that through the cooperative efforts of its members it would be possible to realize the full benefits of communications-satellite technology. 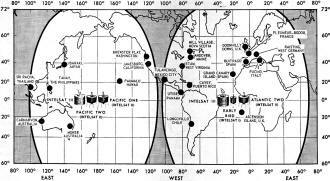 On August 20, 1964, the United States and thirteen other nations signed the Intelsat Interim Agreement establishing the Consortium. The Interim Communications Satellite Committee (ICSC), governing body of lntelsat, was then charged with developing the first commercial global satellite system and drafting a suitable permanent set of working agreements to be adopted by 1970. Comsat acts as the U.S. representative to the ICSC and, under terms of the Interim Agreement, has also acted as Intelsat's manager for the space segment of the global system. Membership in Intelsat is open to any nation which is a member of the International Telecommunication Union (ITU) and participation in the organization is based on a quota system which is related to each nation's potential use of the satellites. What began as a Consortium of nineteen nations in 1964 has grown to over 63 today and the ICSC is represented by delegates from eighteen nations or groups of nations. It is significant that the Soviet-bloc countries are not members of Intelsat. Since the amount of external telephone traffic from the Soviet bloc is very small, they have had little need for international satellites. This also means that the Soviet quota would be small and Russia would have virtually no voice in Intelsat. Since the U.S. has traffic-related voting power in excess of fifty percent, this situation is politically unacceptable to Russia. As a result, Russia developed its own system for internal Soviet-bloc communications (Molniya) and has offered these satellites to other countries (Intelsput). Since, until recently, different earth-station frequencies were used, few non-Soviet countries have participated (principally France). Fig. 3. The Early Bird communications system in June, 1965. The earth station at Mill Village was just being completed. The comsat economic revolution be­gan on July 26, 1963 when a Delta launch vehicle successfully boosted a 150-pound Syncom into geo-stationary synchronous orbit. This launch achieved a number of firsts: It proved that a launch vehicle could perform the complex maneuvers needed to achieve synchronous orbit. 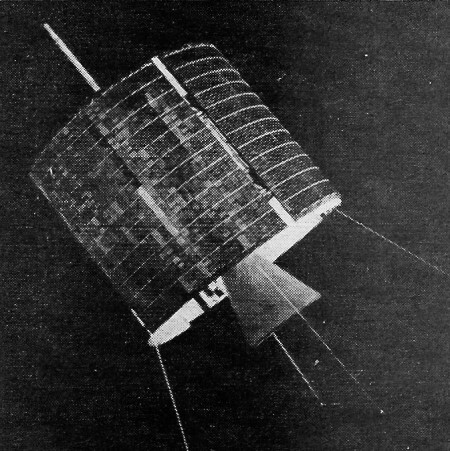 Not only was this the first stationary orbit satellite to be launched, but it was also the first comsat to be spun for gyroscopic stability. But most important of all, it finally dispelled all doubts about this orbit for comsats. Although the 0.27-second delay was noticeable in telephone conversations, test panelists judged the effect not objectionable. Although the higher path losses were certainly present, other financial considerations more than compensated for this disadvantage. Earth stations could be greatly simplified since they did not have to track a moving satellite. Previous plans that required two tracking antennas at each site (one following the comsat being used, the other acquiring the next satellite) could be dropped. These major cost savings could be applied to larger antennas with higher gain, higher transmitter powers, and more sensitive receivers. In addition, the elimination of tracking would produce large operating savings. The result of these comparisons was heavily in favor of the synchronous satellite. In the space segment, great savings were also evident. Syncom proved that a simple station-keeping system could be used to keep the satellite fixed as a stable platform over the earth. Three satellites, rather than 20 to 50, would cover the entire world. It was clear that these platforms could use antennas that radiated power only at the earth disc in view (about 17°) and that narrow-spot beams could be used and directed at high traffic points. As a result of these considerations, Intelsat decided to perform a synchronous experiment to aid it in deciding between medium and stationary altitudes. The experimental satellite was to be twice as heavy as Syncom (utilizing an improved Delta), transmit more power, and employ wider bandwidths. It was also expected that this satellite would provide service urgently needed by NASA for Apollo. A contract for this satellite (which was later named Intelsat II) was awarded to Hughes Aircraft, developer of Syncom, and the first launch of four experimental satellites was scheduled for late in the year 1966. 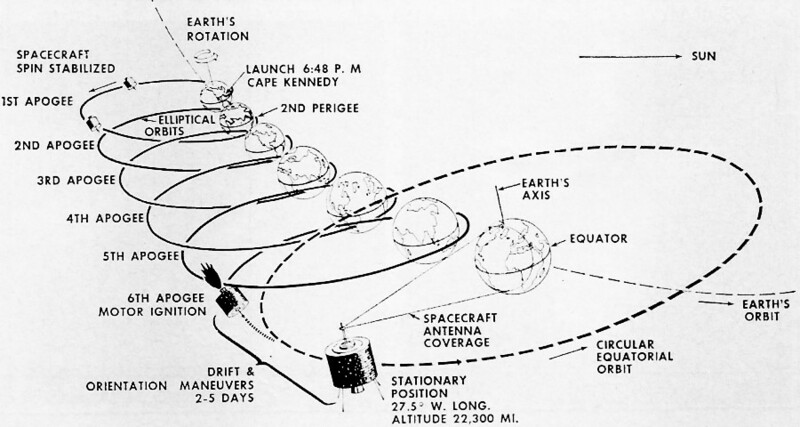 Concurrently, Hughes proposed that a slightly modified Syncom be orbited early in 1965 to provide early operational experience. This proposal was accepted and at 7:02 p. m. April 6, 1965 Early Bird (later renamed Intelsat I) was ejected into a synchronous elliptic transfer orbit (perigee 195 miles, apogee 23,000 miles) by the third-stage of a thrust-augmented Delta launch vehicle. See Fig. 2. For three days the satellite was tracked to determine its orbital parameters and on the sixth apogee a command was sent from the Comsat earth station at Andover, Maine to fire the apogee motor. This circularized the orbit at synchronous altitude and the first commercial comsat was in a stationary orbit. For the next few days the attitude control gas jets were fired occasionally to further refine the orbit and position Early Bird at 27.5° West longitude over the Atlantic (east of Brazil). Table 2. 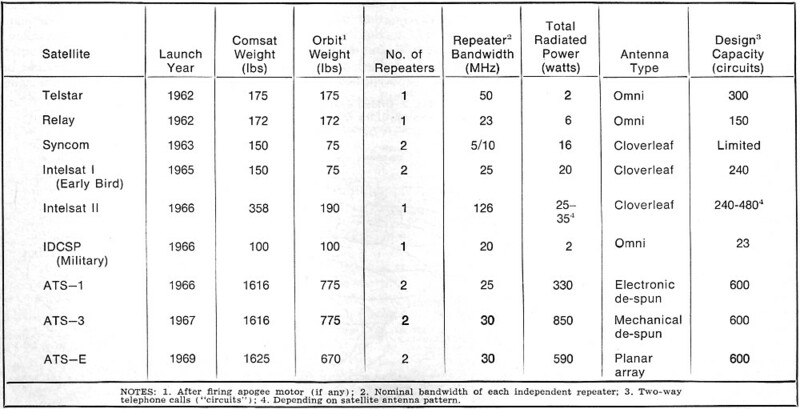 Important characteristics of a number of experimental communications satellites. At this time there were only five earth stations in operation that could utilize Early Bird. 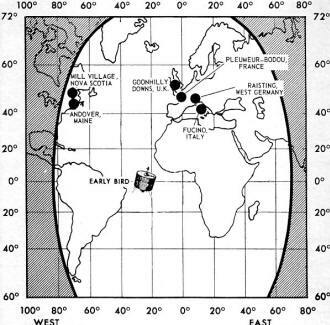 These were the Comsat station at Andover, Maine (then leased from AT&T which had developed it for Telstar ), the British GPO station at Goonhilly Downs, the French research station at Pleumeur-Bodou, the Gelman Bundespost station at Raisting, and the Italian Telespazio station at Fucino (see Fig. 3). Under completion was the Canadian station at Mill Village in Nova Scotia. New Comsat Pacific gateway stations were under construction at Brewster Flat, Washington and Paumalu, Hawaii. Although only few earth stations were in operation, Early Bird proved its value early in June, 1965 when it provided emergency commercial service for eight days while an Atlantic cable break was being repaired. This was prior to formal inauguration of Early Bird TV service on June 28, 1965 in a transatlantic dedication ceremony by British and Canadian Prime Ministers Wilson and Pearson, West German Chancellor Erhard, and President Johnson. Although Early Bird proved to be quite successful, it was limited in power, capacity, and multiple-access capability (see Table 2). In this tabulation of experimental comsat characteristics, the orbital weight of the synchronous satellites is lower because of the loss of apogee motor propellants. The number of repeaters listed is the number of active repeaters and does not include standby redundant repeaters. Early Bird's two 25-MHz bandwidth hard-limiting repeaters each provide 10 watts of effective isotropically radiated power (EIRP) through a cloverleaf antenna pattern which was squinted to favor the Northern hemisphere. Since the repeaters are not linear, only a single FM-modulated carrier can be handled by each (with up to 240 voice channels or one TV channel). This means that only one earth station on each side of the Atlantic can simultaneously use each of the repeaters. Of course, these two stations are required to complete both ends of two-way telephone conversations ("circuits"). As a result, all Early Bird telephone traffic must first be routed to a single gateway earth station. Four stations in Europe and two in North America have taken turns in using Early Bird and multiple-access (the more desirable multiple use of the satellite by many stations) has not been possible. Multiple access would have to wait for the 1967 launch of Intelsat II. 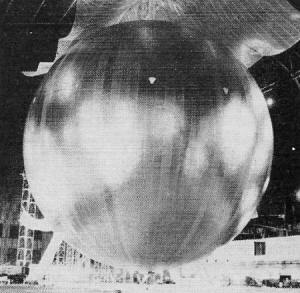 Launched on Jan. 24, 1965, Echo II is still the largest satellite in orbit. Measuring 135-ft in diameter, the 547-lb reflecting sphere is made of aluminum-coated Mylar. Seventy-two envelopes of pyrazole crystals released gas in sunlight to inflate sphere. This particular satellite, of course, was not an active repeater, but merely served as a reflector of radio signals. Telstar, launched July 10, 1962, was the second medium-altitude comsat to use active repeater. Developed by Bell System and launched by NASA, the 175-lb satellite provided the first transatlantic TV and telephone transmissions. Spiral antenna at top was for telemetry and command, while communications signals were handled by phased array around the middle. NASA's experimental medium-altitude active repeater satellite, Relay, provided over 3 years of test transmissions. The 172-lb satellite received at 1725 MHz and transmitted at 4170 MHz using the two discone antennas at top. Dipoles at the bottom are for telemetry and command. Relay was visible between U.S. and Europe for as long as 70 minutes al a time. The world's first stationary-orbit satellite, Syncom, revolutionized satellite communications. This 75-lb satellite proved that the geo-stationary synchronous orbit is the best for communications. Early Bird (later called Intelsat I) is the world's first commercial communications satellite. Weighing 75 lbs, this sychronous-orbit satellite provides 240 2-way voice channels between U.S. and Europe. Successor to Early Bird, Intelsat II is more than twice as large. Three of these satellites are providing communications to both northern and southern hemispheres in the Atlantic and the Pacific basins. Aside from its technical limitations, Early Bird conclusively proved the many advantages of stationary satellites and so, in February 1966, lntelsat formally voted to develop synchronous satellites exclusively. Today Russia is the only country still retaining non-synchronous comsats. This is partially because much of Russia is north of the 60° latitude where low earth-station elevation angles are required to reach a synchronous equatorial satellite. Low grazing angles require earth-station locations without obstructions on the southern horizon and are more subject to atmospheric propagation effects. Canada, however, which also has much land area above 60°, has chosen synchronous satellites as the method it will use to reach its northern cities. This suggests that Russia's continued use of its 12-hour elliptic-orbit Molniya system is for largely military and financial reasons; the satellites are hard to view from other countries and investment in the system has been too great to warrant a change. Like Early Bird, Intelsat II was to be experimental and was to help decide between synchronous and medium altitudes. As it turned out, this decision was reached well before the first Intelsat II (called Lani Bird by the Hawaiian press) was launched on October 26, 1966. Unfortunately, the satellite's apogee motor did not fire properly and so the comsat remained in its elliptical transfer orbit. Lani Bird did, however, provide limited commercial service and inaugurated live television between Hawaii and the U.S. mainland on November 18, 1967. 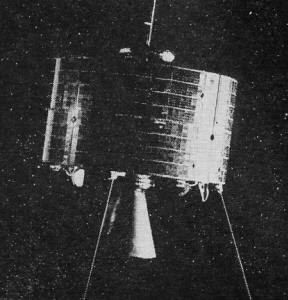 The second Intelsat II series satellite, launch cd on January 11, 1967, was successfully emplaced in synchronous orbit and provided the first. full-time service over the Pacific. More than twice as heavy as Early Bird (see Table 2), Intelsat II is higher-powered, its antenna can be squinted on command (doubling its capacity), and it provides a wide-band linear repeater for multiple access (see Fig. 4). Fig. 4. Arrangement of the components contained inside of Intelsal II. Intelsat II transmitter power is provided by four 6-watt travelling-wave tubes (TWT's) in parallel, any three of which can be operated at a time. When carrying a single message or TV-loaded FM carrier, the repeater TWT's are driven to saturation to provide the maximum possible satellite EIRP. If two or more FM carriers are to be amplified (the multiple-access case), drive power must be reduced (or backed-off) so that the TWT's operate linearly. Unless this is clone, the non-linear limiting characteristics of the saturated TWTs would produce intermodulation distortion products among the various carriers. These products interfere with the desired signals, creating unacceptable distortion and also robbing useful power from the TWT's. Unfortunately, making the TWT linear requires a significant back-off from saturation thereby reducing both the maximum EIRP available and the total capacity of the satellite. Thus, FM multiple access causes reduced total capacity and requires accurate earth-station power control to proportion TWT power among all users. The answer to these problems will be in the use of digital time-division multiple access (TDMA). Each earth station would transmit a burst of digital messages to the satellite within an allocated time slot and stations would then sequentially utilize the full power of the satellite. TDMA experimental equipment is current being tested by Comsat with Intelsat II and it is probable that this access technique will be eventually adopted by Intelsat. Three Intelsat II satellites have been successfully launched, two providing service over the Pacific and the third over the Atlantic. For satellites not intended to produce revenue for Intelsat , they have been unexpectedly successful. In 1967, Comsat reported that almost $155-million of capital funds had not been used because system costs were running well below estimates. The Department of Defense has also been actively developing its own private system of military communications satellites. On June 16, 1966 a Titan III-C launched the first eight satellites in the Initial Defense Communications Satellite Program (IDCSP) into sub-synchronous orbit (about 100 miles below synchronous). At this altitude the satellites slowly drift easterly at about 24° a day. To date 26 of these 100-pound IDCPS satellites have been placed into orbit. Their principal objective has been to establish an initial experimental military comsat network. Each IDCSP satellite is designed to operate with a variety of terminals from fixed 60-foot-antenna earth stations, to 18-foot transportable stations, down to 6-foot shipboard terminals. The satellite can handle up to eight simultaneous carriers. Because of the low radiated power (2 watts), non-directive antenna, and small earth stations, the largest capacity per carrier is only eleven voice channels. (There are a total of eight carriers used, and the total number of voice channels is limited to 23.) Also, since the ring of slowly moving satellites occasionally bunches together, coverage gaps are left between tracking earth stations. 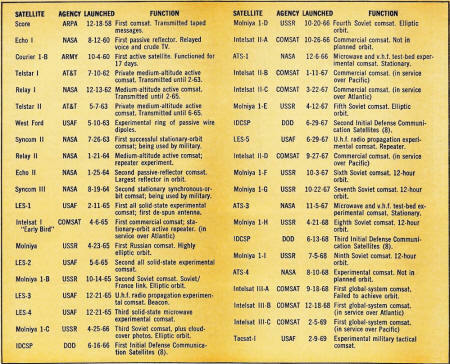 Partially because of these limitations, the Defense Department announced in June, 1968 its decision to proceed with an advanced Phase II Defense Satellite Communications System that would employ large stationary satellites with directed antennas. Since the IDCSP satellites incorporate six-year timers to turn the satellite off, the advanced system (DSCS-II) must go into service by late-1971. In sharp contrast to IDCSP, DSCS-II will have a capacity of several thousand voice channels. The MIT Lincoln Laboratories, under Air Force contract, developed a series of Lincoln Experimental Satellites (LES). The first two satellites of this series contained solid-state microwave repeaters and provided the Air Force with experience with medium-altitude comsats prior to IDCSP. 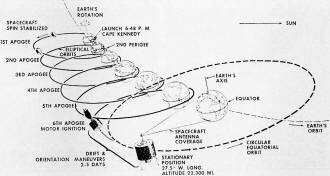 LES-1 included the first attempt to direct an antenna so as to keep it pointed at the earth. LES-3 contained a u.h.f. beacon and LES-5 a u.h.f. repeater in the military aeronautical band (225-400 MHz) and performed mobile communications tests. These tests led to the decision to develop Tacsat-I, an experimental s.h.f./u.h.f. tactical satellite launched early this year. This large satellite is being used to perform military tactical experiments with mobile terminals developed for this program. One final series of experiments deserves mention; the NASA Applications Technology Satellites (ATS). 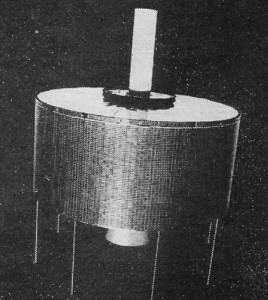 This series of test-bed satellites was designed to perform several experiments, including communications, at synchronous altitude. ATS-1 employs an antenna beam which is counter-rotated from the spin-stabilized satellite, thereby fixing the beam at the earth. ATS-1 utilizes a phased array that is electrically de-spun. While this involves no moving parts, the difficulty with this approach is that the array is inefficient and several complex arrays are needed if several beams are required. ATS-3 de-spins its beams mechanically by rotating the antenna structure so that it remains aimed at the earth. Although this approach involves a moving structure, the earth coverage gain is significantly higher than for a phased array (18 dB vs 7-14 dB). ATS-1 (Pacific) and ATS-3 (Atlantic) have served as emergency back-ups for the Intelsat satellites; ATS-3 transmitted the 1968 Mexican Olympics to Europe and ATS-1 relayed the recovery of Apollo 8 from the carrier Yorktown. They have also performed a series of multiple-access experiments comparing FM and SSB access. Both satellites also contain 40-watt v.h.f. 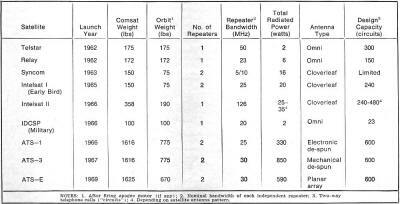 repeaters which have been used for experimental aircraft communications. ATS-E will be the final satellite in the current series. It will attempt to use the force of gravity to keep the vehicle stable and pointed at earth from synchronous altitude. A planar array will be used to beam communications signals at the earth from this stable platform. Since the force of gravity is so small at synchronous altitude, there is some question whether it can keep the vehicle stably pointed at earth. ATS-E will also perform the first millimeter space-to-earth communications experiments at 15.30 and 31.65 GHz. The trans-stage of a Titan III-C is depicted here ejecting IDCSP satellite into sub-synchronous orbit. Each launch contains 8 of these 100-lb military satellites. This 85-ft antenna at the earth station at Paumalu, Hawaii has served as gateway station to the mainland. The facility has been recently expanded with an additional 96-ft antenna for Pacific traffic. Almost ten years to the day after Score, a long-tank Delta lifted the first operational communications satellite into orbit. Part 2 of this article will examine the operational satellites of today and tomorrow.